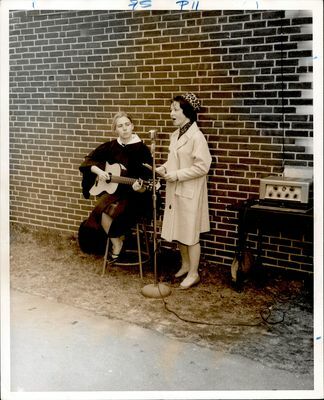 Photograph of two Lesley College Students performing outside infront of a brick wall. One student, wearing a graduation gown, sits on a stool playing guitar. The other student, wearing a leopard print pillbox hat, leopard scarf, and trench coat signing. PA equipment is placed on a table to the right of the students.